Joe McDonnell died at 5am on Wednesday July 8. He was the fifth man to die on hunger strike in the 1981 protest in the H-blocks. As republicans prepare to commemorate the 29th anniversary of Joe McDonnell’s death with a series of events this week, Sinn Féin Belfast Chairperson Bobby Storey explained that Joe’s death and funeral took place in the context of a national and international outpouring of solidarity with the prisoners. Bobby, who was involved in organising Joe’s funeral, said: “No doubt the British government and establishment were infuriated by the global media attention on the deaths of the first four hunger strikers. They were very concerned by the fact the funerals showed mass support for the prisoners, as could be seen in the 100,000 people who turned out to Bobby Sands’s funeral. Bobby Storey said the previous funeral in Belfast – Bobby Sands’s – had been a huge embarrassment to the British establishment. “The British government were determined to prevent a re-run of this. The attack on Joe’s funeral took place in this context. It was a political decision and a pre-planned act of aggression against the mourners by the British army and the RUC,” he said. “Everyone will remember the courage and dignity shown by Joe’s wife Goretti and their children, the broader McDonnell family, and Joe’s comrades and friends as his remains were brought from the house on Lenadoon Avenue for Mass at Oliver Plunkett’s Church. On top of Joe’s coffin, which was flanked by an IRA Guard of Honour, were the black beret, gloves and tricolour of a Volunteer. As the cortege left the chapel, it made its way out of Lenadoon down the Shaws Road towards the Andersonstown Road. “When it reached Sinclair’s Garage an IRA firing party in full uniform and armed with Garrand rifles emerged onto the road from the side of what is now Connolly House and took up a position waiting to salute their fallen comrade,” Bobby said. “As the firing party waited for the cortege to arrive, republicans had to keep the media back, while three British army helicopters hovered ahead. “When the cortege reached the firing party it stopped. The firing party fired a three-volley salute to Joe. Bobby said that as the funeral moved on the British army and the RUC attacked. “First they launched an attack on the house the firing party had entered but this quickly developed into a wholesale attack on the entire funeral cortege. “The British soldiers – marine commandoes – smashed down the door of the house where the firing party and other republicans were located. The republicans attempted to escape out the back but the first one out of the house, Micky Brady, was arrested. “Paddy Adams was shot in the back as he tried to get out the window with a rifle. The next two arrested were Seany Simpson and PB Rooney. PB endured a severe beating and was thrown down the stairs. Then Joe Maguire and Linda Quigley were arrested. “Then began the assault on the funeral itself that is still vivid in people’s memories. The British army and the RUC disregarded the sanctity of the chapel grounds and ran down through St Agnes’s grounds, and down St Agnes’s drive firing plastic bullets indiscriminately at republicans who had bravely come in response to the assault on the house,” Bobby said. 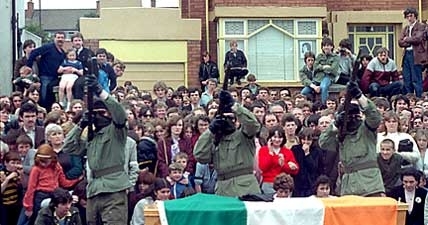 “As one republican put it, the image of the storm-troopers of the British army and RUC sweeping through the chapel grounds firing plastic bullets, and hundreds of people – men, women and children lying flat on the ground on the chapel steps on the Andersonstown Road – evokes scenes of persecution by military dictatorships around the world. 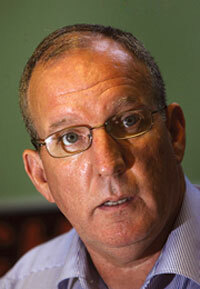 Bobby said the attack on Joe’s funeral was the first of many attacks on republican funerals.